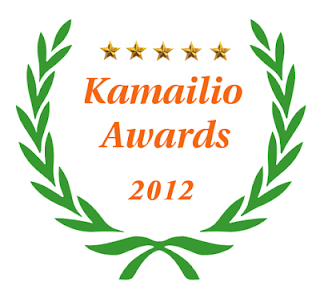 This blogging festivity came to its 6th edition, Kamailio Project Awards, mainly granted for the activity during previous year, 2012. Following the rule of past years, each category has two winners. Overall, the 2012 was the year where the number of contributors and development activity for Kamailio SIP Server exploded comparing with previous year (e.g., over 20 brand new modules). The first half of 2012 was filled with development and release of major version 3.3.x, the other half with development of soon to be released v4.0.0. Beside lots of new and appealing features (e.g., websockets support, embedded msrp relay, IMS extensions), v4.0.0 brings a single set of modules, the duplicates being removed, marking the finish of Kamailio - SER integration. Carlos Ruiz Díaz - http://caruizdiaz.com - active community member, publishing even a consistent contribution recently, his blog contains useful information, many posts related to C code development for Kamailio. Luis Martin Gil - http://www.luismartingil.com - managing a blog offering a nice set of handy tips and scripts for VoIP and not only, he has submitted few C code patches for Kamailio as well. Jitsi - a truly open source softphone project coordinated by Emil Ivov, very rich in features, including video conferencing, instant messaging and presence, desktop sharing. Kamailio and Jitsi collaborated in the past in common public projects such as Google Summer of Code. Used together, the two application offer flexible alternatives to paid or walled garden services such as Skype or Google Hangout. Klaus Darilion - involved in community for very long time, being also part of management board, Klaus was a very active presence in our forums, helping many users to sort out complex scenarios and advanced SIP routing needs. Victor Seva - for taking the challenge and time to follow up Debian distribution policies, polishing our packaging specs and code, bringing Kamailio back as an official package of Debian project. cassandra connector - contributed by Anca Vamanu of 1&1 AG, the module generated high interest from the community, in a world demanding more scalability and high availability of services. websocket transport layer - without doubt the hottest topic nowadays is WebRTC. Thanks to Peter Dunkley of Crocodile RCS, Kamailio was among the first server applications supporting websockts as transport protocol, allowing browsers to call between them using SIP as signaling protocol. The new feature became quickly an high attraction, being used thoroughly during interop testing and prototyping of innovative WebRTC services. Jason Penton - more than 10 new modules related to IMS specifications have been pushed during last year by Jason who is working for Smile Telecoms. It makes Kamailio one of the most advanced IMS platforms out there, and I am not referring to open source space only. Ovidiu Sas - another veteran member of the project, Ovidiu (working at VoIP Embedded) had a large amount of contributions last year. Besides new modules such as xhttp_rpc and xhttp_pi, he spent a lot of time to enable cross compilation in Kamailio's build system. Luis Guaman - for participating at Cluecon 2012, Luis, who is running Interlancompu.com, presented how to use Kamailio for providing location-based services, as component of their Find Me And Chat service. Nir Simionovich - for managing the presence of Kamailio at Astricon 2012 exhibition, taking care of project's booth and promotional activities. Nir is running GreenfieldTech, being involved in open source VoIP for many years. System One NOC - actively involved in the community via Javier Gallart and contributing code via Vicente Hernando to scalability components such as Redis connector, System One NOC is using Kamailio to handle routing for large number of DIDs and provide redirect services. Truphone - started during OpenSER times as an innovative service to cut roaming costs and bring convergence between GSM and IP worlds, Truphone continues its adventure in real time communications bringing out new services that increase user experience and benefits. Edvina - run by well known open source VoIP and IPv6 advocate Olle E. Johansson, Edvina has expanded the set of services related to Kamailio, increasing as well its activity in contributing code and documentation to Kamailio project. Voxygen - run by Dean Elwood, one of the VoIP pioneers launching the voipuser.org SIP service many years ago, Voxygen is one of the businesses out there relying on Kamailio to create new products and services for companies that look for innovation in communications. (Side note about voipuser.org: website is still down due to hard drive crash on web server, but SIP service is still up and running (served by Kamailio v4.0.0 at this very moment)). ITSPA UK Awards, London - the yearly awards festivity organized by UK's Internet Telephony Service Providers Association grated Members' Pick award to open source telephony projects. The event took place at the House of Commons Members Dining Room, Palace of Westminster, London, on 21st of March 2012, hosted by Dr Julian Huppert MP, Vice Chair of the Parliamentary Internet Communications and Technology Forum. Besides picking the award, I had the chance to meet many companies involved in VoIP and RCS, discovering more use cases of Kamailio. University of Oslo - an active presence within the project community, via Øyvind Kolbu, the involvement of this university helps propagating the usage of our project in academic world. University of Pennsylvania - with another attractive contribution, the SCA module authored by Andrew Mortensen, this university joined Kamailio's development team, confirming that ghd project is offering a flexible framework that can meet demands from industry as well as research and academic world. The SCA module implements Shared Call Appearances, as defined in Broadworks SIP Access Side Extensions Interface Specifications. James Body - in a category where awarded people are selected based on long term activity (not only based on what happened last year) and limited to two winners per edition, we are still at those supporting us from early 2000. James is one of them, being around from SIP Express Router times. His advocating of the project convinced during our early years many VoIP providers to start with this project as the telephony routing engine. Randy Resnick - being the producer of the weekly VoIP Users Conference, I am sure most of the VoIP word owns at least a bit to Randy. It is our case as well, from SER to OpenSER and Kamailio, we had many chances to promote the project and highlight its benefits during the live sessions moderated by Randy. As of Personal Facts related to the project, besides still a lot of coding, I continued to propagate the knowledge about Kamailio, with development workshops and administration trainings, run by Asipto.com. Kamailio SIP Server v3.3.4 stable is out – a minor release including fixes in code and documentation since v3.3.3 – configuration file and database compatibility is preserved. Kamailio (former OpenSER) v3.3.4 is based on the latest version of GIT branch 3.3, therefore those running previous 3.3.x versions are advised to upgrade. There is no change that has to be done to configuration file or database structure comparing with older v3.3.x. SIPit is the event created by the SIP Forum to test the SIP protocol impementations that Open Source projects and vendors have. It’s not a certification, it’s a test lab where everyone test their implementations – from very basic SIP calls to advanced functions, like multiparty video conferencing, WebRTC and security. SIPit is now once a year in different locations. SIPit 30 was hosted by Cisco in RTP, North Carolina, USA. Kamailio was of course there, following a long tradition of participation in SIPit for the project. At SIPit there are many one-to-one tests where two development teams test their products for interoperability. There are also multiparty tests, and it’s in these tests that a proxy gets the real heat. Many implementations meet in a room and set up various forms of tests. All kinds of devices connect to the SIP server and exchange calls – over TCP, UDP, TLS and the new SIP over Web-socket transport. Video, audio and text is exchanged and in some cases the proxy is attacked in various ways with large amounts of traffic. This year, Olle E. Johansson, a member of the development team and long-term Kamailio user and teacher, took Kamailio to SIPit. After many years of testing Asterisk at SIPit, testing Kamailio at SIPit was a new thing for him. Since the 4.0.0 beta has an extremely solid and well-tested core, it was rather painless. The new modules for WebSockets and SIP Outbound was tested and a few new issues found and reported to the development list. Other developers were standing by to assist and fix issues as they showed up, so there was a large virtual team available to assist the testing. Kamailio was also the foundation for the SIPit Automated Self Tests that have been in operation for a few SIPit events now. After this SIPit event, many of these tests will be made available for the public – including the IPv6-o-matic for dual stack and IPv6 testing and the SIPit TLS-o-Matic for TLS secure session testing. Olle is also planning to set up a web-socket enabled server for TLS and RTCweb testing in the future. The Kamailio Development team is already looking ahead to the next SIPit event with yet another new release!